In October 2018, demolition of the 135-year-old historic structure officially began with little notice to many in the community at large. Odd as it may now seem, the legacy of Trinity Episcopal Church may end up being the role it played in helping save other historically significant buildings or monuments from future demolition, even while that ended up being the sad fate of Trinity Church itself. As if one last gasp to save its life, an outpouring of community support from near and far made their voices heard in any way they could, but the planned demolition was clearly too far along and moving way too quickly for any possible consideration of a demolition delay. Even as hundreds, eventually more than a thousand, signed a petition seeking to delay or halt demolition, the heavy equipment was already in place and stones carefully set in place more than 135 years ago were tumbling to the ground. The sights and sounds were preserved and may now be an example for current and future generations. The following history is from The Waterbury Evening Democrat, SOUVENIR EDITION, published on November 22, 1903, Thanksgiving Day, Page 28. The organization of Trinity Episcopal church was but the natural result of the growth of this city and the Episcopal church in the city. Among those who withdrew from St John's church, the mother church, in 1877 in order to form a new parish, were the following: Nathan Dikeman, R. E. Hitchcock. E. L. Frisbie, E. C Lewis, Aner Bradley, J. S. Castle, C. Pierpont, Jr, H. P. Camp, J. E. Coer, F. E. Castle, T. R. Taylor, S. P. Williams, J. K. Smith, E. D. Steele, J. P. Merriman, J. W. Smith, Samuel Booth, W. W. Bonnett, F. H. La Forge. The parish was formally organized at a meeting held May 22, 1877, at which time the following officers were elected: Wardens, R. E. Hitchcock, J. W. Smith, clerk, E. T. Root, vestrymen, E. L. Frisbie. J.B. Castle, Nathan Dikeman, A. O. Shepardson, E. C. Lewis, S. P. Williams, the Rev F. T. Russell, E. D. Steele, J. C. White, F. E. Castle. The church prospered from the beginning. 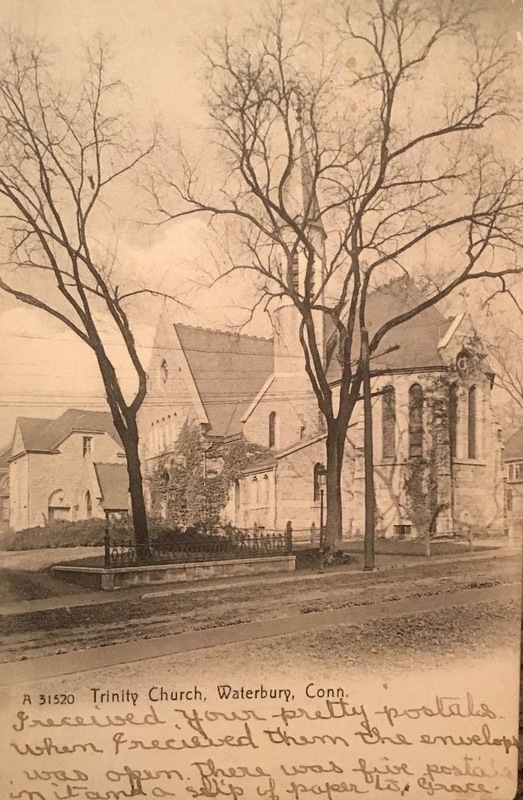 The first services were held in a building on Grand street formerly used as a Universalist chapel, and were conducted by the Rev Mr Russell, who had been ask ed to take spiritual charge of the parish until a rector could be secured. Soon after the Rev R. W. Micou was appointed pastor and retained the position for fifteen years. Soon after the organization of the parish plans were formulated for the erection of a church edifice. A lot on Prospect .street, the present site of the church, was purchased in December, 1881, from C.B. Merriman for $10,000. The corner stone was laid May 18. 1884. The offertory on Easter Sunday, 1880, was sufficient to cancel the debt, $4,000, then remaining on the church which was therefore consecrated on May 27. The cost of the church and lot amounted to more than $70,000, of which S. W. Hall's gift of $10,000 with the accumulations, paid $22,500; G. W. Burnham's gift, $10,000; the parishioners of St. John's, about $5,000 and the remainder was raised by subscriptions in the parish. The church, which is one of the finest in the state, is of Plymouth granite. The outside dimensions are about 135x65 feet. It is a memorial to Mrs S. W. Hall, a fact that is recorded on a tablet in the chancel: "In memoriam. Mrs Nancy Austin Hall, born April 13, 1815; died February 8, 18G8. To perpetuate her memory this tablet is erected by the last will and testament of her husband, Samuel W. Hall, to whose generous bequest this church owes in large part its erection in this year of grace, 1883." The history of Waterbury says of Trinity church: "The erection of such a church was a great under taking for a new society, largely made up of young men, most of .whom were dependent upon their own exertions for all they had and it was not accomplished without much effort and self-denial. But the rapid growth and financial success of the parish prove that the free church system is adapted to a congregation of moderate means in a growing manufacturing town." The Rev Mr Micou remained rector of Trinity church until June, 1892, when he accepted a call to the professorship of systematic theology in the Philadelphia Divinity school. He was succeeded by the Rev Frederick Dashiels Buckley, wiio officiated for the first time as rector of Trinity church on October l, 1892. During his pastorate the church has steadily increased in membership. In April, 1893, a rectory on North Willow street was purchased. It stood on the ground which is reported to be the probable birthplace of the Rev James Srovil, the first resident rector of the Episcopal church in Waterbury. Several years ago a handsome residence, adjoining the church on Prospect street, was purchased and is now used as a rectory. 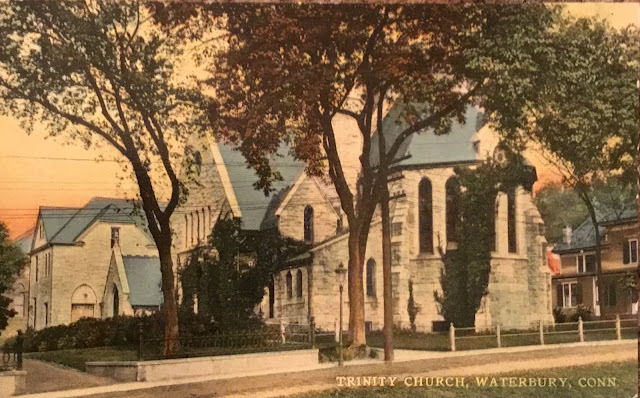 The Trinity Episcopal Church Parish was established in 1877, an offshoot from the nearby St. John's Episcopal Church (still standing on the west end of the Waterbury Green). A more thorough history of the parish and church will be posted here shortly after research of historical records is complete. If you have a personal connection to this parish, received a sacrament or attended mass here, please consider sharing your living history in the comments below. Please be respectful of others if you are responding to a comment made by another.